I just wanted to say a HUGE thank you to you and all your volunteers. My class and I have thoroughly enjoyed every session we have been to at the Kitchen Garden (and when you came to our school with the salad, too!). The kids have all learned loads and were so proud to take the salad we made with the peas, potatoes and carrots you gave us last week around school for all the teachers to try. Everyone said it was delicious! Congratulations on such a successful season and I look forward to providing you with some more little helpers next term! The kids LOVED it, so many of our kids have no outdoor space at all at home and first hand experience of digging and growing is really significant. 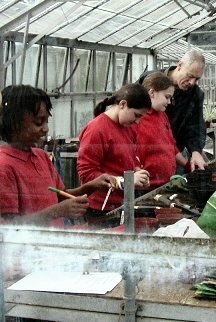 And for us as staff at The William Hogarth School it tied in with lots and lots of curriculum activities. 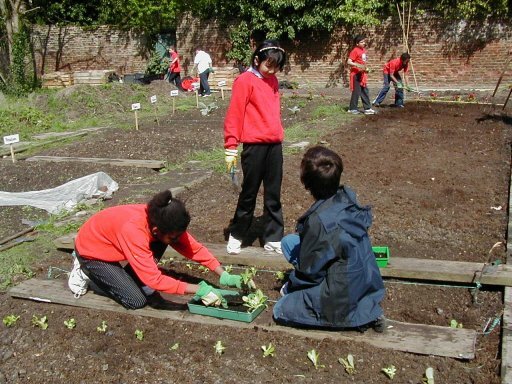 We came as part of our History topic "Children in the Second World War", but also because it is real experience of growing food and vegetables, of healthy eating, of treating the environment properly, of citizenship and caring for the community. For us especially as we have just won £1000 to make allotments in the school grounds any contact with people who know how to garden and grow things is of immense value to our kids. Lots of our kids live in the Glebe Estate but had no idea that the garden existed. It was really valuable. I'll be in contact next term to arrange another visit if that's okay. Just a few lines to say thank you for the Kitchen garden Project. The children I brought had quite a bit of horticultural experience tending their veg plots and herb garden but the opportunities of working to much bigger scale and with a wider range of plants was really appreciated by them. Team building skills and co-operating in the clearance of the "virgin" scrubland were much improved. The salad day "treat" was amazing for some children, they had never had lettuce with dressing before, it made them aware of the possibilities open to them to make healthy food interesting. I hope the project continues next year, I think that in terms of grounds development and children growing food we are probably ahead of most schools yet the loss of an opportunity to work on a project of such a scale would be a big loss. Apart from the fun side of things and enhancing children's social development the project obviously supports the schools Science and Health Education Programmes. See you in September hopefully. I just wanted to write and say how much I am enjoying working in the kitchen garden and really appreciate the time and effort put in by the volunteers. It is very rewarding for us, especially when we see and taste the end products, but more than that, a great opportunity to recreate something from the past and open up a beautiful part of Chiswick House Grounds I never knew existed despite living here all my life. I can't wait to see what you have in store for us in the Autumn!